In this July 27, 2017 file photo, contaminated water storage tanks are seen on the Fukushima No. 1 nuclear plant grounds, in Okuma, Fukushima Prefecture. Airborne radiation in “difficult to return” zones around the Fukushima No. 1 nuclear plant was as high as around 8.48 microsieverts per hour as of summer last year, according to data presented by the government nuclear watchdog on Jan. 17. The operator of the Fukushima No. 1 nuclear power plant has said it will resume late this week a survey of the crippled No. 2 reactor using a telescopic arm, hoping to obtain images of melted nuclear fuel. In Friday’s survey, Tokyo Electric Power Company Holdings Inc. aims to investigate the area beneath the reactor’s pressure vessel, through which nuclear fuel is believed to have melted. The step is needed to help develop a plan for removing the fuel for the ultimate decommissioning of the plant. Tepco, in announcing the move on Monday, said it will insert a 13-meter long pipe at the bottom of the pressure vessel and then deploy a camera at the tip of the pipe to film the bottom of the outer primary containment vessel, where fuel is believed to have accumulated. The device will also measure the temperature and radioactivity levels in the area. The survey is expected to take one day. In January last year, an inserted camera with a limited view captured possible melted fuel in the interior of the No. 2 reactor. The following month, Tepco attempted a survey using a scorpion-shaped robot inside the unit, but the effort ended in failure due to a technical flaw. Nearly seven years after the March 2011 earthquake and tsunami that wrecked the plant, details of the damage to the reactors remain largely unknown due to high levels of radiation. Reactors 1, 2 and 3 at the four-reactor plant suffered core meltdowns due to a loss of cooling water in the world’s worst nuclear crisis since the 1986 Chernobyl disaster. The nuclear pact between Japan and the United States that allows Japan to reprocess spent nuclear fuel and enrich uranium, automatically renewed Wednesday, after Tokyo made no move to end it by Tuesday, the deadline to do so. The bilateral nuclear agreement, which entered into force in July 1988, had authorized Japan to establish a nuclear fuel recycling system over 30 years to July 2018. As neither side has sought to review the pact it will remain in force indefinitely, but can be terminated six months after either party notifies the other. Such a notification can be made at any time. The pact is “part of the foundation of our country’s use of nuclear power” and also “crucial to Japan-U.S. relations,” Chief Cabinet Secretary Yoshihide Suga told a news conference Tuesday. Under Japan’s nuclear fuel recycling system, spent fuel from nuclear reactors is reprocessed to extract uranium and plutonium. These materials are then recycled into fuel called mixed oxide, or MOX, for use in fast-breeder reactors or conventional nuclear reactors. But uncertainties over the country’s reprocessing program have grown after most nuclear plants in Japan suspended operations amid safety concerns following the 2011 disaster at the Fukushima No. 1 plant. In December 2016 the government decided to decommission the trouble-prone Monju fast-breeder reactor at the core of the fuel cycle policy. The U.S. government does not see any immediate need to review the pact partly because of tensions in East Asia, where North Korea is developing nuclear weapons and China is expanding its military, according to sources with knowledge of the matter. Japan possesses 47 tons of plutonium within and outside the country. If it is unable to reduce its stockpile, that may spark concerns in the United States and calls for reviewing the pact may increase. Should GE’s Mark 1 Nuclear Reactor Be Recalled Worldwide Like a Faulty Unsafe Automobile? Josh Cunnings (Narrator): Good evening and thanks for joining us at the EnviroNews USA news desk for the fifth segment in our 15-part mini series, Nuclear Power in Our World Today. In our previous episodes, we explored several Manhattan-era messes in the United States, but tonight, we begin by discussing the troublesome situation on the ground at the Fukushima Daiichi power plant on Japan’s eastern coast. Now, if you trace Japan’s troubles back far enough, then once again, you’re going to find yourself right back here in the good old U S of A — in the state of California — during the 1970s — with General Electric at the helm. The project that we’re referring to was the development of the Mark 1 boiling water nuclear reactor — the very same model which melted entirely in units 1, 2 and 3 at Fukushima. Now, when it comes to people who are qualified to talk about the many issues and problems surrounding the Mark 1, few could be more capable than former nuclear reactor operator and engineer Arnie Gundersen. As a matter of fact, the distinguished expert is all too familiar with the ins and outs of the design. So, without further ado, here’s another excerpt from this simply fantastic interview with Arnie Gundersen by EnviroNews USA Editor-in-Chief Emerson Urry. Take a listen. Gundersen: Fukushima Daiichi has four units — one, two, three, four — and they’re all Mark 1 designs. In addition, there’s another 35 in the world, including 23 here in America, that are the same design. A group of three engineers quit General Electric in 1976 because they realized the design was not safe. Two of the three are still alive and living here in California, and they are my personal heroes. They understood before any of us did how seriously we really didn’t understand what it was that the engineers were doing. Bridenbaugh: My boss said to me, that if we have to shut down all of these Mark 1 plants, it will probably mean the end of GE’s nuclear business forever. I started with GE immediately after I got out of college as a mechanical engineer, and I started out as a field engineer responsible for supervising the construction and startup of power plant equipment across the United States. In the first ten or fifteen plants that GE sold of the large-scale commercial boiling water reactors, they did so on what’s called a “turnkey” basis. They built the whole thing, get it operating, and then they turn the key over to the utility, and the utility then is theoretically capable of operating it to produce electricity. Fukushima 1 was basically a turnkey plant provided to TEPCO by GE. In 1975 the problem developed that became known at the Mark 1 plants — the some 24 Mark 1 units in the United States, and also those overseas, including the Fukushima units — had not taken into account all of the pressures and forces that are called hydrodynamic loads that could be experienced by the pressure suppression units as a result of a major accident. We didn’t really know if the containments would be able to contain the event that they were supposedly designed to contain. Not only were there the containment problems that existed with the Mark 1s, which I was very familiar with, but there were a number of other problems with the GE boiling water reactors and with the nuclear program in general. And I got disillusioned with the speed with which these problems were being addressed, and then in the middle of the night I called my boss at GE and I said, “My recommendation is that we tell the U.S. utilities that GE cannot support the continued operation of these plants.” And my boss said to me, “Well, it can’t be that bad Dale, and keep in mind that if we have to shut down all of these Mark 1 plants it will probably mean the end of GE’s nuclear business forever.” That conversation occurred at about midnight on January 26, and that clinched my decision on resignation on February 2. The accident that occurred in Fukushima, it’s some two years later now, and we don’t really know the condition of the reactor core; we don’t really know the condition of the containment. The radiation levels are so high inside the containment that it’s very difficult to get in there. It will be years before that plant site is cleaned up. The damage that has been experienced at Fukushima is so great and so extensive that I don’t think any one utility, certainly TEPCO, has the capability to be able to pay for all of that. So, it becomes a national issue. I think it would be a good idea to not have reliance on nuclear units. They’re very risky enterprises. And I would like to see a world that is provided with electricity by alternative energy supplies. Gundersen: When Maggie [Gundersen] and I were walking one day in February [a month] before the [Fukushima] accident, she said to me, “Where is the next accident going to be?” And I said, “I don’t know where, but I know it’s going to be in a Mark 1 reactor.” And, I’m not alone. It’s not like I was clairvoyant. The Nuclear Regulatory Commission had a report that they published in 1982, and they said there was an 85 percent chance, if there was a meltdown in a Mark 1 reactor, that the containment would explode. The writing was on the wall. Urry: How many of these things are still out there in operation today? Gundersen: In the U.S., all 23 continue to run, and as a matter of fact, the staff of the Nuclear Regulatory Commission recommended some pretty substantial improvements, and the politically appointed commissioners, who have no nuclear background, overrode the staff and said, “no, we’re not going to do those changes.” So, the Commission has been actively involved in thwarting the safety improvements that everybody knows are needed. Voice of Child Narrator: My mom, she makes underwater fans that are powered by the moon. My mom makes airplane engines that can talk. My mom makes hospitals you can hold in your hand. My mom can print amazing things, right from her computer. My mom makes trains that are friends with trees. My mom works at GE. Cunnings: If GE, a company that successfully weaseled its way out of paying any taxes whatsoever in the U.S. wants to boast night and day on the mainstream media airwaves — the same mainstream media which it once nearly monopolized — that it “brings good things to life” and makes “underwater fans that are powered by the moon” and locomotives that “talk to trees” perhaps the company should also bother to mention its own manufacture and sales of faulty nuclear power reactors that quite frankly, bring good things to an early death. Oh, and by the way, the company not only builds the reactors that breed uranium into plutonium for bombs, oh no, its role goes much deeper. In fact, GE is in the business of manufacturing the actual bombs too. “We bring good things to life.” Seriously? Let’s get real. Narrator: The Hanford Nuclear Reservation, a massive 570-square-mile facility, where General Electric made plutonium for the U.S. military. Subject #1: I began loosing my hair, which I had long naturally curly hair. Narrator: [Of] 28 families who lived in a small area near Hanford, 27 of them had suffered severe health problems. Narrator: … all of which are associated with exposure to high doses of radiation. Narrator: According to the business press, General Electric is the most powerful company in the United States, and GE is rapidly expanding its control of markets worldwide. Subject #3: I’d like to wake Jack Welch up in the middle of his atomic power lab; let him explain why their husbands died of cancer related to the asbestos. Subject #4: I find their ads disgusting. I find that ad disgusting. Narrator: Four million individuals and 450 organizations in the U.S., Canada and around the world, have decided to join the GE boycott. Subject #4: Are you asking us to clean up your toxic waste again!? Subject #5: What GE does is not bring good things to life. They mislead the American public. Subject #6: General Electric is in this business of building weapons for profit — not for patriotism, not for the country, not for the flag, but for profit. Ronald Reagan: Until next week then, good night for General Electric. Gundersen: This picture of a boiling water reactor containment is taken in the early 70s. It was taken at Browns Ferry [Nuclear Plant], but it’s identical to the Fukushima reactors. Now, let me walk you through that as I talk about it. There are two pieces to the containment, the top looks like an upside down light bulb, and that’s called a “drywell.” Inside there is where the nuclear reactor is. Down below is this thing that looks like a doughnut, and that’s called the “torus,” and that’s filled almost all the way with water. The theory is that if the reactor breaks, steam will shoot out through the light bulb into the doughnut, creating lots of bubbles, which will reduce the pressure. Well, this thing’s called a “pressure suppression containment.” Now, at the bottom of that picture is the lid for the containment. When it’s fully assembled, that lid sits on top. The containment’s about an inch thick. Inside it is the nuclear reactor that’s about eight inches thick, and we’ll get to that in a minute. Well, this reactor containment was designed in the early 70s, late 60s, and by 1972 a lot of people had concerns with the containment. So, in the early 70s, the Nuclear Regulatory Commission recognized this containment design was flawed. In the mid-70s, they realized the forces were in the wrong direction; instead of down, they were up, and large straps were put into place. Well, then in the 80s, there was another problem that developed. After Three Mile Island engineers began to realize that this containment could explode from a hydrogen buildup. That hadn’t been factored into the design in the 70s either. Well, what they came up with for this particular containment was a vent in the side of it. Well, these vents were added in the late 1980s. And they weren’t added because the Nuclear Regulatory Commission demanded it. What the industry did to avoid that was create an initiative and they put them in voluntarily. Now, that sounds really proactive, but in fact, it wasn’t. If the Nuclear Regulatory Commission required it, it would have opened up the license on these plants to citizens and scientists who had concerns. Well, by having the industry voluntarily put these vents in it did two things: One, it did not allow any public participation in the process to see if they were safe. And the second thing is that it didn’t allow the Nuclear Regulatory Commission to look at these vents and say they were safety related. In fact, it sidetracked the process entirely. Well, these vents were never tested until Fukushima. This containment was never tested until Fukushima. And it failed three times out of three tries. In retrospect, we shouldn’t be surprised. Looking at the procedures for opening these vents, in the event electricity fails, requires someone fully clad in radiation gear to go down to an enormous valve in the bowels of the plant and turn the crank 200 times to open it. Now, can you imagine, in the middle of a nuclear accident, with steam and explosions and radiation, expecting an employee to go into the plant and turn a valve 200 times to open it? So, that was the second Band-Aid fix that failed, on a containment that 40 years earlier, was designed too small. Well, with all this in mind, I think we really need to ask the question: should the Mark 1 containment even be allowed to continue to operate? The NRC’s position is: well, we can make the vents stronger. I don’t think that’s a good idea. Now, all those issues that I just talked about are related to the Mark 1 containment. The next thing I’d like to talk about is the reactor that sits inside that containment. So, that light bulb and that doughnut are the containment structure; inside that is where the nuclear reactor is. Now, on a boiling water reactor, the nuclear control rods come in at the bottom; on a pressurized water reactor they come in from the top. All of the reactors at Fukushima, and 35 in the world in this design, have control rods that come in from the bottom. Now, that poses a unique problem and an important difference that the NRC is not looking at right now. If the core melts in a pressurized water reactor, there’s no holes in the bottom of the nuclear reactor, and it’s a very thick eight to 10-inch piece of metal that the nuclear reactor core would have to melt through. But that didn’t happen at Fukushima. Fukushima was a boiling water reactor; it’s got holes in the bottom. Now, when the nuclear core lies on the bottom of a boiling water reactor like Fukushima, or the ones in the U.S., or others in Japan, it’s easier for the core to melt through because of those 60 holes in the bottom of the reactor. It doesn’t have to melt through eight inches of steel. It just has to melt through a very thin-walled pipe and scoot out the hole in the bottom of the nuclear reactor. I’m not the only one to recognize that holes at the bottom of a boiling water reactor are a problem. Last week an email came out that was written by the Nuclear Regulatory Commission right after the Fukushima accident, where they recognize that if there’s a core meltdown, and it’s now lying as a blob on the bottom of the nuclear reactor, these holes in the bottom of the reactor form channels, through which the hot molten fuel can get out a lot easier and a lot quicker than the thick pressurized water reactor design. Now, this is a flaw in any boiling water reactor, and the Nuclear Regulatory Commission is not recognizing that the likelihood of melting through a boiling water reactor like Fukushima, is a lot more significant than the likelihood of melting through a pressurized water reactor. The third area is an area we’ve discussed in-depth in a previous video, and that’s that the explosion at Unit 3 was a detonation, not a deflagration. It has to do with the speed of the shockwave. The shockwave at Unit 3 traveled faster than the speed of sound, and that’s an important distinction that the Nuclear Regulatory Commission, and the entire nuclear industry, is not looking at. A containment can’t withstand a shockwave that travels faster than the speed of sound. Yet, all containments are designed assuming that doesn’t happen. At Fukushima 3 it did happen, and we need to understand how it happened and mitigate against it in the future on all reactors. So, we’ve got three key areas where the NRC, and the nuclear industry, don’t want people to look, and that’s: 1) should this Mark 1 containment even be allowed to continue to operate? Cunnings: In America, when a vehicle, or even a part in a vehicle, is deemed unsafe for the population at large, the government forces automakers into costly and multi-billion dollar recalls — and the mainstream media does its part by shaming those culprit companies, relentlessly beating them to a bloody pulp for their negligence and their reckless endangerment of innocent American citizens. The Mark 1 nuclear reactor is an extremely outdated model with obvious design flaws. Apparently, it has so many problems, that as Mr. Gundersen pointed out, three of the engineers who originally designed it ended up resigning because they knew it wasn’t safe — and that was well before Three Mile Island or Chernobyl ever happened — long before the public had experienced the fright, and health consequences of a full-scale nuclear meltdown. Surely, after the triple meltdowns at Fukushima, Japan, it appears the Mark 1 is far from safe, yet here in the U.S., the government continues to let operators drive this faulty nuclear vehicle down the road — knowing full well that it could fall apart and crash, harming, or even killing innocent Americans at any time. Perhaps the government should consider holding nuke-plant manufacturers, like GE, to the same standards it demands from automakers, and punish them with shameful recalls when they market a piece of faulty equipment that poses any danger to the public. So, just what would a recall of the Mark 1 nuclear reactor look like, and who would issue or enforce it? The Nuclear Regulatory Commission? And how could enough political will ever be mustered for such a massive undertaking? It would surely cost more than any auto recall ever has, but frankly, who should give a damn (except for General Electric’s shareholders of course)? I mean, if it ain’t safe, then it just ain’t safe mate. Besides, after paying zero taxes, GE’s pockets should be plenty deep enough to handle such an event — right? The concept of an all-out recall on the antiquated General Electric Mark 1 reactor is one that we will continue to explore. As a matter of fact, in tomorrow’s show, we’ll discuss the problems with the Mark 1 a little further. Tune in then for episode six in our series of short films, Nuclear Power in Our World Today, with esteemed expert and whistleblower Arnie Gundersen. Signing off for now — Josh Cunnings — EnviroNews USA. Haramachi ward, Soma City ~ 50km north of Fukushima Daiichi nuclear power plant: radioactively contaminated vegetation stored in plastic bags piled up and covered by a tarp. When the organic matter decays it produces methane which has in this case built up inside the well-sealed tarp. There’s an elementary school just beyond this … hopefully no children, or ignorant/reckless adults, will be tempted to ‘experiment’ with this deadly balloon. The renewal of a Tokyo-Washington agreement on the use of nuclear energy has sparked fears that Japan may take the chance to make nuclear weapons, experts said. Japan and the United States decided on Wednesday to automatically renew their agreement on peaceful uses of nuclear energy in July when the 30-year pact is due, Japanese media reported. Japan will be more under the sway of the US after the agreement, which went into effect in 1988, is renewed. The accord, after renewal, can be scrapped in six months if either Japan or the US notifies the other, the Kyodo News said. The pact lays the foundation for Japan’s nuclear fuel cycle project, allowing Japan to extract plutonium and the remaining uranium from spent nuclear fuel and reprocess it into mixed oxide (MOX) fuel for use in nuclear plants. Japan had tried not to renegotiate the agreement so as to maintain its nuclear fuel cycle policy. Zhou Yongsheng, a professor of Japanese studies at China Foreign Affairs University, said the renewal means that the Washington administration holds a more tolerant attitude toward Japan’s possession of nuclear materials. “According to its current technology level, Japan certainly has the ability to manufacture nuclear weapons within a short period of time, thus possessing the nuclear materials will undoubtedly add risks to the already unsteady security situation in Northeast Asia,” Zhou said. Kono is critical of the country’s nuclear fuel cycle project. The Mainichi Shimbun reported that some officials within the US Department of Defense and the State Department’s Bureau of International Security and Nonproliferation are concerned about Japan’s stockpiling of a massive amount of plutonium, which can be converted into nuclear weapons. “Japan owns nearly 50 tons of separated plutonium. That is enough for over 5,000 nuclear weapons. 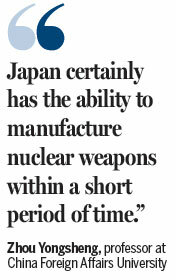 Yet Japan has no feasible peaceful use for most of this material,” Alan J. Kuperman, associate professor and coordinator of the Nuclear Proliferation Prevention Project, said in a signed article published by Kyodo News on Aug 17. Kuperman asked how a country that forswears nuclear arms came to possess more weapons-usable plutonium than most countries that have nuclear arsenals. In their co-authored article published in Japan Times, three US experts concluded that it is undeniable that reactor-grade plutonium – extracted from spent reactor fuel by reprocessing – can be used for nuclear weapons. They were Victor Gilinsky, program adviser for The Nonproliferation Policy Education Center who served as a Nuclear Regulatory Commissioner under US presidents Gerald Ford, Jimmy Carter and Ronald Reagan; Henry D. Sokolski, the NPEC’s Executive Director; and Bruce Goodwin, a Senior Fellow at the Center for Global Security Research at the Lawrence Livermore National Laboratory.